Short-term trading gives you a very short window to make trade decisions and this gives even more limited time to react to market conditions. It might lead to rash investment decisions, and end in a huge loss. It is indeed difficult to keep emotions out of the equation when decisions need to be made quickly. Hence it requires dedicating ample time in the pursuit of studying and understanding the market if you are considering short-term trading. You have to be ready to take snap decisions regarding any news on the market at any given point in time. It is impossible to predict the future, that’s the work for psychics. However, it is quite easy to predict when stock prices will rise and during when there would be an uptrend in the stock market. Similarly, it easy to predict that prices will go down when there would be a downtrend. These predictions should be a result of hard facts and figures, and not on impulse. To try to predict something as unpredictable as the stock market analysis should take precedence over emotions. 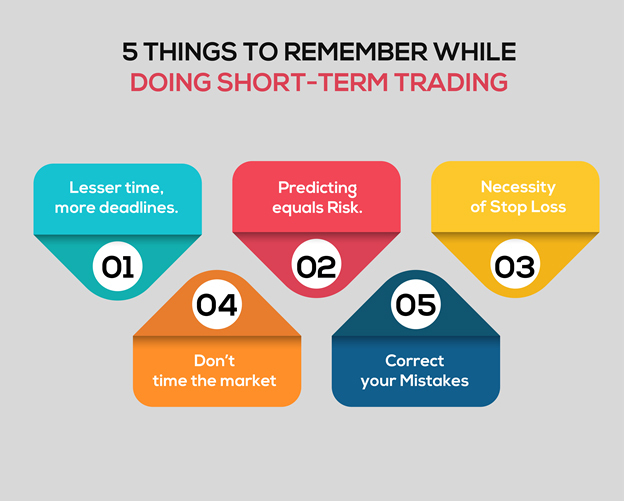 While short-term trading it is essential to have a stop loss. No matter how strong your conviction/confidence in the market is, it is always advisable to have a stop loss. It is wise to book losses when possible rather than riding on losses. You should keep emotions in check as the sharemarket moves & based on your financial goals set your target price and stop loss. Anytime is a good opportunity to invest in the stock market. You prevent yourself from timing the stock market. It is a waste of your time, effort, resources and money. More important than timing the market is the time in the market. Of course, there will be few who will make money by timing the market, just as there will be people who will go on to win the lottery. Then why take such a big risk when the odds are stacked against you? Stock markets are not devices to earn a quick buck. In short-term trading, it is not what is right or what is wrong, but what the people think at that moment as right or wrong that governs the direction. However, in the long run, the market always comes back to its rational position. Due to one bad trade, the trader should not refrain from stock-trading again, as there are chances that in doing so he might miss out on potential gains. Instead, the trader should analyze what went wrong the last time and correct the mistakes next time. Since the stock market is a capricious being, one must try to better oneself and to make the most of it.